Three and a half years ago, I painted our front door green. Since then, I have received many positive comments about it; I have taken my profile pictures for the blog in front of it; I have taken three years of the first day of school and last day of school pictures with it; I even said I wanted to be buried with that green door. Well, that’s not going to happen because a week ago, I decided to paint over the green door. It all started when I innocently stopped by our local Sherwin Williams store to get some swatches for other areas I was planning on painting. By the way, Sherwin Williams paint colors are so true to the chip. Better than any other brands, in my opinion. Anyway, I was in there and the helpful woman got my color swatches for me when I noticed it. The color. I needed that color in my life. It’s called Spicy Hue and is essentially”orange” only warmer. I took it home and I knew immediately where I wanted to paint my new color: on the front door. But the interior design “chic” who writes this blog called this color coral. Ahem, NO. It is not coral. It is a burnt rusty orange-y color. Hello. Needless to say, I fell in love with this color after I saw it on a door. That looked nothing like my door. But still, I felt like we needed a change. Call it the cooler temperatures that started to appear the week I found this, call it needing to spruce up a door that sees a lot of sun exposure, call it I can’t ever be happy with something so let’s mess it up. All I know is I needed a change. By the way, excuse the iPhone photography but apparently when one gets into a “painting frenzy”, one gets too lazy to pull out the damn Canon camera with the big girl lenses. Yes, I have written a blog for over six years, why do you ask? I sat and stared at my green door for a good ten minutes with a paintbrush in hand. Until I just did it. This broke my heart a little. I adored that green color and I honestly have no logical reason about why I would get rid of it. A few months ago, I noticed that the previous paint was starting to show through the green and thought I would need to touch it up. See, normal people would just go out and get a sample size paint container and find the color swatch and make the touch-up. I, however, have never been and will never be normal. Bye-bye Paradise Green. You were very good to us. I posted the above picture on Instagram and the color looked a little more orange than I wanted it. That is the deal with paint color: it doesn’t usually look right after one coat so do not judge it until you’re finished. Just about right. This color is magical to me because it looks different at different times of the day. I took the above picture around 3’o clock in the afternoon. In the above, it almost looks like my original door color which made me a little sad. Shiver. I hated this door color. Let’s try another picture of the new one. small foam roller brushes. It is so much easier and faster to use a roller brush on your doors. It also looks smoother. you will also need small foam brushes as well to get the corners or hard to reach places. Clorox wipes or just a wet paper towel (to wipe any mistakes). – paint (I used Behr exterior paint and primer in one. Always get paint and primer in one so you can skip a step). GIRL! THANK YOU for finding the exactly perfect color for my doors! I might have a paint store errand today! I have been looking for a good one for 2 years…too yellow, too orange, too brown, too red….this one though! This one is so perfect if you are looking for that in between color! Plus, the more coats you put on the rustier it gets. It’s pretty! I like your checklist of things you need to paint. I gave never tried to drink and paint and I am amazed at your bravery. I can vouch for painting as exercise, as I am in the process of painting several large areas in our house back-to-basic-white, and I can eat a big ham and cheese sandwich every day for lunch while painting and my pants still fit. Our door also gets a lot of sun exposure, but three years ago we PAID someone to stain it the current color so I am not ready to say that we threw our money away on that one. Andrea recently posted…Can I Have a Minute? I believe that if I was a little drunk while painting, it would turn out much better. And we just got done doing a huge painting project in our home and I think I lost five pounds. But gained it back because FOOD. That door is a thing of beauty. It so is and it is making me miss the green door less. So you must know this. My door is orange. ? I didn’t paint it. It came that way znd it’s not the same shade. But still! Bopsie Twins!! It’s like I mind melded with you. I so love this! It’s the same color as my pantry door! And my dining room. It’s such a fun color. Very nice on the front door!! You and I are paint color soul mates!! You should look at my kitchen green, it is called Offbeat Green by Sherwin Williams and it is AMAZING. Oooh, have you have transformed my green with envy to another hue!?!?! If I paint my door the right color, will you appear? Is that how i will know!?!? 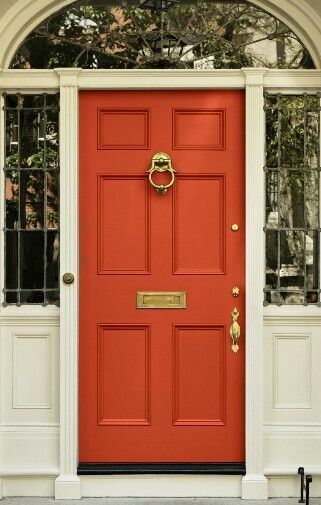 I stumbled onto your blog because I have decided to paint my exterior door and was looking for specific paint/brand ideas for a burnt orange color. I absolutely LOVE your door and am thinking of checking out this very same paint! But I’m a bit confused: you say that you chose Spicy Hue by SW but, later, in your list, you mention Behr. What am I missing? Okay so I always go to Sherwin Williams to get the paint chip. THEN I take the paint chip to Home Depot or Lowe’s….whatever is closer for you…and have them tint the Behr paint for me! It is so much less expensive than SW paint. Now, sometimes SW does have sales throughout the year, but I am not sure if the sales are as low as the Behr paint is normally. When we did this project as well as our living room, Behr was on sale so it made the decision really easy. I hope this clears up the confusion and I hope you come back and visit me! Aha! That makes a lot of sense–thanks for clarifying! As it so happens, SW has a huge sale this weekend, so I think I will stick with them for this project because I’m concerned about durability with an exterior paint job. Thanks again for the inspiration and info, and enjoy your gorgeous door! You are welcome! Good luck and happy painting! Your new door color looks great! I really like the burnt orange. It’s not screaming-Halloween-pumpkin-orange. And, I agree, it’s not really coral, either. Sometimes change is good. That is the perfect description of it! Amen to change, as hard as that can be.